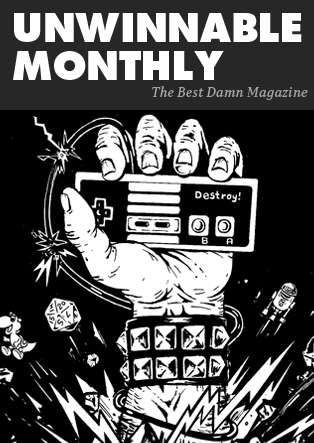 This week, Matt Marrone is on jury duty, Chris Dahlen is playing Netrunner with his kid and Gus Mastrapa reveals what happened to that little girl we met back in Unwinnable Weekly Issue One. 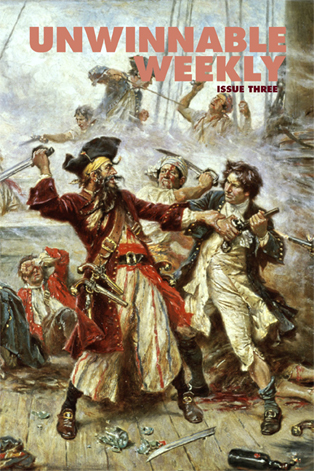 Meanwhile, Steve Haske serves up some ambiguously chilly fiction and I ponder the life and legacy of the notorious pirate Blackbeard. I admit, it is a pretty eclectic mix of writing. Weird, even, at least on the surface. That’s the cool thing about being free form. If you put a bunch of seemingly disparate things together in a deliberate way, you start to find connections between them all. It’s just how our brains work. Sometimes this is a trick of the mind, something psychologist call apophenia. This false pattern recognition is why we see a man in the moon or rabbits in the clouds. Other times, we perceive a truth that would have otherwise remained hidden. This is the “Eureka!” moment, the revelation of discovery and the spark of creativity. True or false, the patterns we perceive are valuable, whether the spawn insights or flights of fancy. What does a four hundred year old pirate have to do with a cyberpunk card game? That’s up to you to decide. This is a reprint of the letter from the editor in Unwinnable Weekly Issue Three. You can buy Issue Three individually now, or purchase a one-year subscription to make sure you never miss and issue!